Did you know that winter months are the most deadly for fires? The increased risk in winter is due in part to more cooking and heating fires, holiday decorations, winter storms, and use of alternative heating sources such as kerosene heaters and wood stoves. If there is a fire, immediately call 9-1-1. Waiting may cause a much larger fire. 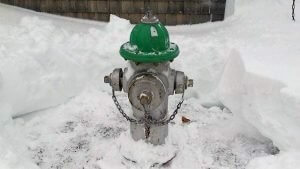 Clear snow away from fire hydrants located on or near your property. Do it TODAY! Replace the batteries in your smoke detectors and CO2 detectors. heaters can generally be used without venting. least three feet of clearance between combustibles and your heat source. children or pets alone near these heat sources. so you won’t overload electrical circuits. from the house, deck, porch or anything that can burn! If you use a kerosene heater, avoid overfilling and never fill while it is operating or hot.